There’s a competition caution at lap 25. Teams are getting 6.5 miles per gallon. Many of them think they can make it after a pit stop on lap 25. Paul Menard drew the pole. Kyle Busch starts on the outside row. Green flag, two by two into turn one. The outside line noses ahead off turn two, led by Kyle Busch. He’s clear and drops to the bottom lane. 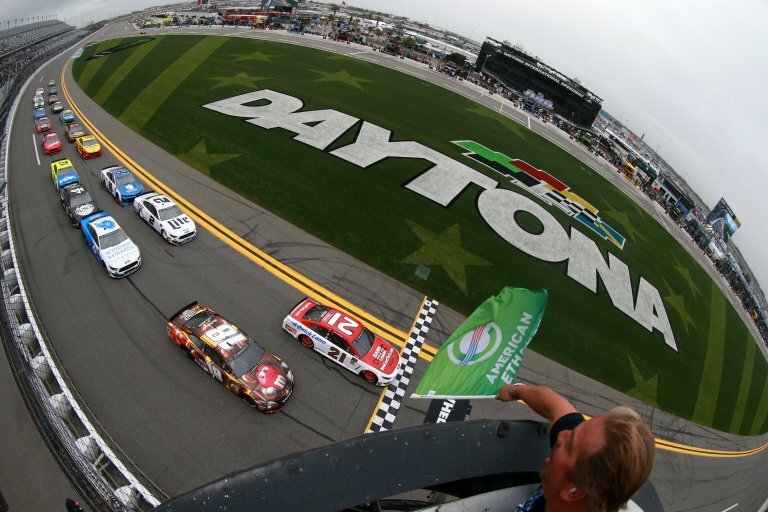 Paul Menard leads the field to green in The Clash at Daytona International Speedway!Who do you think will take the first checkered flag of 2019? Lap 2, Paul Menard moves to the outside lane. With a push from Keselowski, the Ford Mustangs take the lead. Kyle Busch and the entirety of the inside lane is falling through the field. Busch has dropped outside the top 10. 9 laps complete, the caution is out. Rain has fallen on the speedway. The rain shower is out of the way and we’re set to resume. Green, Keselowski checks up on the top lane. Paul Menard slides in front of him. That was planned. Lap 20, the field runs single file from 1st to last. They run a few feet off the outside wall. Lap 24, they remain single file. Nobody heads for the pit lane. Lap 25, most of the field heads for the pit lane. Paul Menard is the first one to pit entry. Aric Almirola is the first car to the pit exit with fuel and two tires. Austin Dillon leads the 5 cars that stayed on the track. They head for the pit lane. Suarez and Almirola have been handed a penalty. Paul Menard and Ryan Blaney will lead them to green. Green, Menard leads into turn one. They run three wide for 4th on back. Menard pulls up to block Hamlin on the outside lane. Lap 35, the outside lane is moving. The middle and inside lanes have completely lost momentum. They form a single file line around the top. Lap 41, the rain has returned. There’s a break to dry the track. Green, Paul Menard leads on the outside lane with a huge push from Jimmie Johnson. 22 to go, Joey Logano, Paul Menard and Brad Keselowski have formed a line on the bottom. They’ve climbed to 3rd. 20 to go, Jimmie Johnson has backed up to the bumper of Kurt Busch. They lock and have a run. Johnson is looks to the inside of Menard for the lead before the entry of turn three! Johnson pulls slightly right and tries to side draft. At the same time, Menard comes off the wall a little bit. That’s all it took. Menard and Johnson are around at the front of the field. The track is blocked, everyone is involved! Only 3 cars made it through without damage: Kurt Busch, Joey Logano, Ryan Blaney. Less than 15% of the field remains without damage. NASCAR has called the race early due to rain. Jimmie Johnson has been declared the race winner! 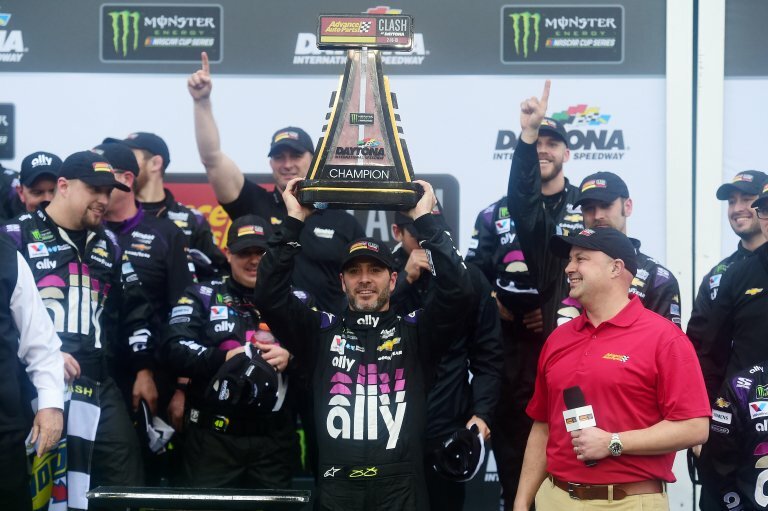 View full 2019 Advance Auto Parts Clash at Daytona race results below.